Being a bit thick at the moment but am considering springing for the IHG ambassador programme. Does it apply to existing bookings I have already made and to all,the subsidiaries brands such as Holiday Inn, Indigo and Kimpton? Unfortunately, it only applies to Intercontinental Hotels. Although having the platinum status may help with some perks at the other properties like Holiday Inn etc. these are not guaranteed. IHG aren’t known for their generous elite benefits unlike say Hyatt for example. This makes the Ambassador program pretty worth while for most people. Myself included! I’d say with both Spure/Ambassador we get benefits 50/50 in Crowne Plaza/Hol Inn etc. What does need looking at is the free night/reward booking system as you can only book a basic room in the booking system with them. Just booked 3 nights in IC Budapest, 2 nights Club Executive with Amb. Certificate which they upgraded immediately to the next level of room and 3rd with free night voucher. In order not to have to move room on 3rd day there followed a trail of emails from the hotel, we had to pay a supplement to move the free room up 2 levels and then they upgraded us (room only) to the same level as first 2 nights and then we had to pay a supplement for 3rd day Club lounge access so the ‘free’ night has actually cost us €120! The 3 nights in total still work out cheaper but bearing in mind you can’t get an advance rate with the Amb. Certificate probably not a whole lot cheaper than booking and paying in advance. Was it worth a hassle and money? I would just move a room tbh. Also, it seems that the trick with “sandwich booking” described here many times no longer works. Perhaps, hotels also read HFP! It was worth it as a special occasion this time but as you say sandwich bookings don’t work as well these days and it also depends how generous hotels are. With rewards/fee nights combined with other bookings it would be better PR for them if the reward nights/free night are at the same level as paid rooms on a 1:1 basis or something. It will apply to your existing bookings. Ambassador status only impacts intercontinental stays. You’ll need IHG status for the other properties. Ok,thanks. I’m currently gold elite so not sure if the platinum benefits I would get via paying for Ambassadors would make it worthwhile for me. I don’t think I’ve ever stayed at an actual Intercontinental Hotel! If you wanted Platinum status you can get it for £99 a year with the IHG premium credit card. That’s on top of the 20,000 points you get for signing up. This is not the loyalty program you are looking for, move along. As a Spire Elite and a regular in IHGs on business I’d say the status is very rarely useful. If you get it anyway via IHG Credit Card spend, or staying a large number of nights with them, great, enjoy, but not worth buying (or mattress running) to achieve IMO. OT – Can anyone convince me not to donwngrade back from Curve Metal to Curve Blue? Amex Platinum covers my requirements like Insurance, Airport Lounge etc. If downgrade is widely recommended, would you leave it until last day (28 days cooling off period) or downgrade now. Travelling to North America next weekend for a week, so would like to have physical card with me, which may not arrive before that. Assume I can continue to use old metal card until activated new blue card in the App. Long term aside, the additional fee free FX ATM withdrawals on Metal will be worth it for your trip to the US next week. Beyond that, and unless that is a regular occurrence, I can’t see the attraction myself if you already have AMEX Plat. “Please note that if your subscription is cancelled, your Curve Metal card will be blocked and no longer usable”. Seems no point keeping it. I’ll be cancelling mine. I also have Amex Plat. I took out the Curve Metal for 2 reasons; Amex support and higher annual spend limits. Amex support lasted about 48hrs and turns out he increased spend limits were simply a lie by Curve. Add those 2 points to the fact that there customer service is beyond dreadful and there’s no reason to give Curve a single penny. Harry, what the s your source for Marriott Amex card launch? So basically, no solid source but an educated guess. if we’re guessing now; I reckon we got around a year of SPG amex. If the uk card was launched in 2010, 10 yr contract..? The fact that the UK Costco Amex survives, despite Amex US and Costco having the biggest bust-up in credit card history (well, not quite but you get the point), means that you can’t read anything into anything. What IS clear is that none of the Amex co-brand cards (BA, SPG, Nectar etc) are likely to survive beyond their current contracts now they are interchange fee capped. I’d of thought Amex dropping co-branded cards would actually be a good thing for point collectors as Mastercard/Visa is more widely accepted than Amex. You would see rewards dropping to under 0.5p per £1 vs 1p now on a free Amex. Anyone else still waiting on the last Avis/BA offer before Christmas of 5,000 Avios posting?? Is there a timeframe?? I never have had any of these offers post easily! Hoping the Avis/virgin offer works better!! Or quite an upgrade depending on priorities and needs. Given that Rob previously stressed that a benefit which is provided 99.9% of the time is not “guaranteed”, this should count as a downgrade in his book. Many hotels are already giving the compo instead of providing the late checkout and upgrade. The new T&Cs are just formalising an existing practice (but some hotels would have previously compensated you more if they couldn’t honour the upgrade). These apply per stay, and since it is unknown for me to ever stay more than 2 nights at the same property, I would rather have the points than the upgrade – but people who value upgrades, especially those with long stays, will be disappointed in the future. This article was about reward stays so I felt it was less of an issue. I think ‘buying out’ 4pm check-outs will be rare because cleaners can’t clean all the rooms at the same time anyway. Giving late check-outs to some guests literally costs the hotel nothing, all that happens is that those rooms go to the bottom of the cleaning rota. It’s only an issue if you have a room category with only a couple of rooms in it I reckon. O/T Curve wallet topups have posted this morning on my Amex. Took a while. Scratch that, they just appeared. Curve now owe me £1 because an Amazon ‘test’ when adding the Curve card has not been refunded. How long ago was that transaction? Would give it 7-10 days then email support. My two small top ups @ £150 each have failed to show thus far. One was on the 28th and one on the 29th. Same, mine posted today, just after the statement has been generated, so that’s nice timing! Normally runs 24 hours behind. No, you are seemingly not… mine the-posted today as well. Pleased to see mine have finally posted as well! OT: When booking Martiott points stay now and ordering the ecertificate later when points are available, which rate do we pay? The category rate now or the category rate at time of getting the ecertificate? I think it is the latter but just want to confirm please. Except last year when it wasn’t so don’t count on that being the case. Thanks Peter, I’ll try it anyway and if it works it is a bonus. If not, I’ll reconsidee other options. Thanks Lee, I’ll go ahead and book some now then before new category increases on 5 March. In theory you pay what you lock in now. Some people had issues after the August scheme merger but I got the impression it was just an IT screw up. Happy to be proved wrong on this though. Hope so, it’s potentially huge with category 8 coming next month. Called today, CSA said rate at time of booking applies even it hotels move up categories. Is it now the case that you can take your feee weekend night in isolation rather than as part of a 2 night package (one paid)? Ts and Cs seem to suggest that? Is this the Ambassador free night? Or am I reading at cross purposes? I never used my free night very last year as the paid night I had to tag on to get it was too expensive to justify. Yes I was referring to the ambassador free night. The current Ts and Cs make it clear that you must include a paid night but the new Ts and Cs are silent on it, unless i’ve missed it? Would make quite a difference. Do free nights from the IHG Credit Card count as reward nights – ie are you guaranteed an upgrade on them as AMB? You are not guaranteed an upgrade on a reward night stay. Sorry – I meant the $20 credit. As in do ICs treat a rewards booking using points differently from the credit card free night? I can’t comment on intercontinental hotels but on other hotels they are just viewed as a normal reward night. It will be interesting to see how Hartford CT does load wise. Lots of big insurance companies there, only a 2hr drive from either New York or Boston, or better yet, about the same to the ferry for Nantucket which is well worth anyones time. But who drives to a city? Having a car in NYC is a right pain. Not least in the wallet. Remains to be seen how the flight will be priced but one way car rental to either may well be less than direct to the hubs. Both are very easy drives. Easy maybe, but I’ve been looking for one ways as part of an upcoming trip, and it’s not that easy, let alone pricing issues. Once they had valid transaction code, there was no reason not to pay. I doubt however, Curve and Amex would kiss and make it up going forward! OT – What is the new Avios card being launched? Rob said it has slipped a few days but definitely coming so hopefully we will know early next week. Sounds like a niche card though as I think he said it will only be of interest to a relatively small number of HFP readers. Possibly a card available only to holders of a certain bank account? If so, Lloyds group would be the obvious suspect? Mrs S is due a current account switch so holding fire to see what happens. I really hope not. It would suggest nearing the end of the Lloyds Amex. £24 for free FX, 1.25Avios/£ and a solo upgrade voucher, it will be very sadly lost. I know it’s coming, I just keep hoping I’ll be the last one out the door. It’s an SME card. Article confirmed for Monday. Has anyone actually had their Lloyds avios duo card cancelled? My Lloyds Avios cards are still going strong. I’ve got the really old Duo Premier double pack and the wife has the newer FX ones. I’ve just earned another 241 voucher on mine and I’ve got hers sitting £200 off another upgrade voucher just waiting to pull the trigger if the bad news arrives. Haven’t had any letters about either being cancelled. I hope that continues. E-rewards seem to suspending Avios registered accounts due to “inactivity” – however they will re-open them if you ask them to, but they will be converted over to an account that can only redeem into BA Exec Club rather than a generic Avios number. I had originally set up my e-rewards account with an Aer Lingus Avios account and was just transferring the points over to BA anyway, however, the major issue is that the maximum monthly award is 1000 BA Avios for 3,500 points rather than 2000 Avios for 6,500 points. i still have Iberia on my account. The key with eRewards is, if you signed up trhough an airline, you can only redeem on that airline and all hotel partners. If ou sign up through a hotel chain, you can exchange to that specific hotel chain or to all airlines partner. If you signed up through Avios, Iberia Plus will not show as a partner. Just curious about the costs associated with upgrading a particular flight. If I booked DUB – LAX on a cheap £5-600 premium economy ticket, how much would it cost to upgrade the long haul flight? I understand it would be 20k avios, but would the extra cash fee be? 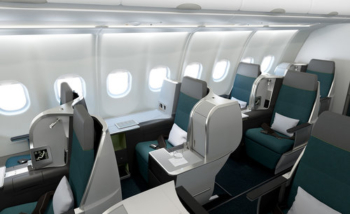 Do a dummy premium economy booking and a dummy club world booking. Look at the ‘taxes, fees, charges’ section of each. The difference between these is the cash cost to upgrade using avios. LHR to SAN was £100 per person per leg recently. If by long haul leg you mean LHR to LAX then I’d expect it to be £100 too. Glad EI finally gets new planes – last time my partner and I flew with them, they casually fixed planes with duct tape!